The SAFLIFT cask/canister system is designed to safely transport loaded transfer casks and canisters with the SAFLIFT strongback lower block from the spent fuel pool area to the canister transfer area. Once the tranfer cask and canister have been placed on top of the concrete cask, the SAFLIFT system provides seismic stability to the stacked casks by supporting the load with the SAFLIFT strongback/lower block. This eliminates the problems and costs associated with building based tie-down of stacked casks. The SAFLIFT has the unique capability to remotely lower the canister (using the canister hoist and grab) from the transfer cask to the concrete cask while the strongback/lower block provides seismic stability. All these tasks are completed using our ULTRASAF single failure- proof lifting system consistent with the requirements contained in NUREG 0554 and 0612. 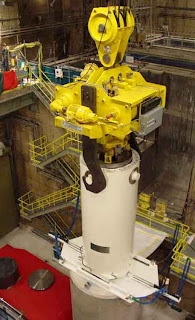 SAFLIFT technology is a culmination of American Crane’s experience as the market leader in nuclear fuel handling. SAFLIFT was engineered to overcome the many problems encountered with outdoor vertical canister/cask transfer facilities. The flaws of the outdoor vertical transfer facilities show that a material handling expert, not cask experts, should design these type of systems. American Crane’s revolutionary, patented design of SAFLIFT is testament to its commitment for providing safe and cost effective material handling solutions. For more information about our SAFLIFT products email us at sales@americancrane.com or call us at 1-877-877-6778.